Nostradamus Enigmas are side missions in Assassin’s Creed Unity represented by the scroll icon on your in-game map. Each Enigma has a starting position and three (and rarely more) hidden symbols scattered within a 300-400 meter radius from the start of enigma. Each hidden symbol has a corresponding riddle that you need to solve in order to find its location. Finding solutions to these riddles can be very hard and you would need to know a lot about the French Revolution and Paris’ history to solve them without help. I used Google and Wikipedia articles quite a few times to decipher some of these. Later in the game I figured out that discovering landmarks (they are marked on your in-game map) and actually visiting them to unlock in-game database entries will also help a great deal in solving riddles. Almost all riddles correspond to some landmark’s description in the in-game database. The symbols can be found on the ground, on windows, on walls, on statues, or any other objects but they become visible only when you activate your Eagle Vision. They also play a characteristic sound when you are nearby so keep your headphones on when hunting for riddle solutions. Enigma missions are a great deviation from your regular assassination activities and they helped me learn a great deal about the French Revolution and Paris landmarks and history. I would recommend all inquisitive types to attempt doing at least a few of these and for collectivists among you there is a great reward in the end, when you complete all Enigmas. Whole point of doing Nostradamus Enigma mission and solving all their riddles is to collect Nostradamus Fragments. You get one for each Enigma you solve. 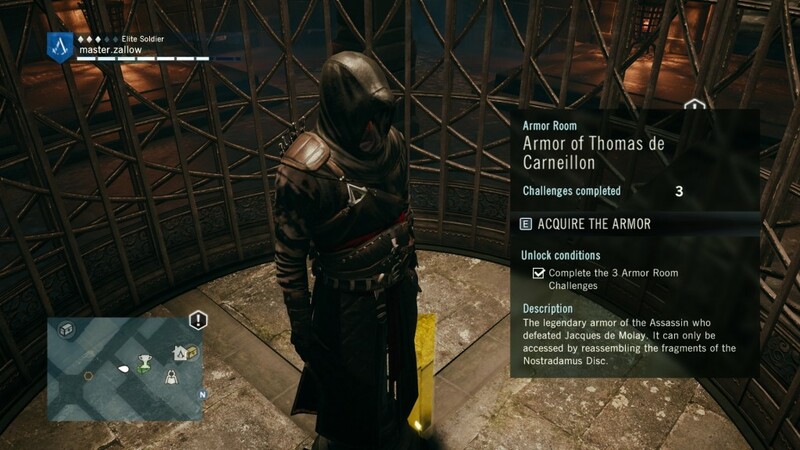 After collecting 18 Fragments head towards a secret room in the basement of the Cafe Theatre, and open the cage where your main reward Thomas de Carneillon Master Assassin Outfit is locked. To open the cage you will have to solve three puzzles (one puzzle gets unlocked after you get 4 fragments, second is unlocked at 10 and third is unlocked when you have all 18). Each time you solve a puzzle you will remove one protective layer of the cage until you can unlock Thomas de Carneillon Master Assassin Outfit. To help you find and solve all Nostradamus Enigmas in AC Unity we compiled screenshot guides for each and every one of them. We provide you with map locations and explanations on how we deduced the locations of each riddle solution. You can find them all in the list bellow. I had the same issue at first, what solved it for me was that when you start the mission you read from some kind of diary in the armor room. Did you also check the symbol right above the diary? I hadn’t and that’s why I could not examine the painting on the second floor. great guide! used it for all but the easiest one (the first one on the list in the game). thank you so much for spending the time so I didnt Have too. Everything was spot on! Great guide. Really useful and user friendly. Like the way you explain the clues and how you worked them out. Hey, this is a great and unique guide! I especially like it because you explain your thought process behind it to give some hints before saying the final answer. It helps people like me out who don’t want to know what the answer is but are stuck or out of ideas. Hey guys, a lot of the landmarks on my map don’t reveal themselves. They just say landmark on the map, even though I’ve visited them. At the moment I can’t do the Nostradamus Enigmas because the landmarks don’t appear on my database. Has anyone else having this issue. Could this be yet another bug. Thought that patch 3 might have fixed it but… nope. Some of the Nostradamus Enigma icons don’t show on the map for me. Do I need to progress further in the story or is it just a bug? I can’t thank you enough for these! I had NO interest in trying to figure them out but wanted to clear them off my map (and get the armor, I guess). Thank you! Amazing work, impressive dedication in finding all the solutions. Great guide! Excellent Guide! Just love it. Many thanks. the last 8 enigmas won’t show up on the map for me, so I can’t even start it, do I have to complete all the missions in the campaing for the last 8 icons to show up? You shouldn’t have to progress much in the story to do enigmas. I did all enigmas when I was around chapter 9. They might not show up on the map if you did not reveal that part of the map with a Viewpoint so try that first. Thanks for the effort Gosu. Very clear and also very informative comments. Just want to say thanks man! I deciphered most riddles on my own, but when I was stumped, or I was tired of running around the map (so I confirmed here before going to a location) your info came in real handy. I really like that you explained your mental process as well, made it feel like it wasn’t just a “go here” faq, felt more rewarding. Thank you for putting together the best guide available on the Internet! I looked at many other guides for help, but yours was the most thorough and simple to follow. Congratulations on a great job done. hey friend!first say the name of the enigma that is in that area then we can help you. If not for these Guides, I would not even look for these. Having to do them 1 at a time and run all over is not my definition of fun. So glad y’all have the proper OCD to find & document these. Thnx a lot bro. It was a lot of help to me. Cool outfit in the end. Super Thnx to the man who helped out. Took a while but still did it. Even showed some mates this website. finally i not understand. was Tomas De Carneillon, Altair? Thanks, man. This really helped, I appreciate the time and effort put forth in making this to assist all of us. Help!! It says I have 17 of 18 but I don’t see anymore scrolls and I’m pretty sure I’ve done them all. I’ve unlocked all view points. Don’t know what else to do. I’ve done all 18 of these and it says I’ve only collected 16 pieces. WOW!! Great, great guide. Guides are usually so boring to me and I hate having to use them as it feels like it takes away from just playing but I honestly had a great time using these when I needed to. Easy to use and my favorite part was how you included your thought process and how you found it. Made it feel like more of an adventure than just cheating lol. i followed everything, i did all the riddles and it says i only have 10 out of 18, and when i go to the map it shows i have no more, am i missing something? Love the fact you tell us how you figured out each enigma. Great guide. Great guide. I would not have been successful without this guide because of lack patience! Awesome guide! I haven’t found anything without it. But I am currently stucked at the final parkour puzzle where steam nock you away from the wall. My caracter refuse to jump to the next holding about halfway into the puzzle and, of course, the steam eventually nock me from the wall again, again and again. Annoying!